Did you ask and then get a Video Testimonial? Did you ask and then get referral business from your customer’s Sphere of influence? Did your Customers use their Social Media and talk about you? Bottom Line: Did “1” Transaction lead to another organically? What is your Value Proposition in Real Estate? In Other words: Why should I hire you to represent me in a Real Estate Transaction? But most importantly: Are you Proud of What you are Selling? 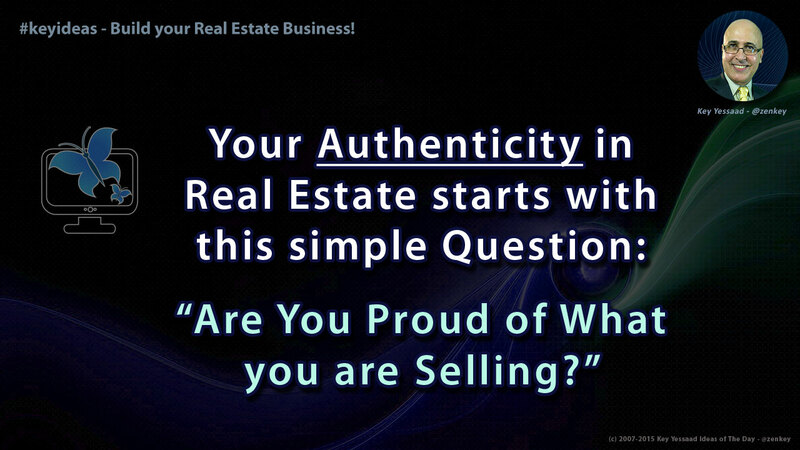 Ponder these important questions as you continue to build your Real Estate Career – your Authenticity will emerge from having the courage to stare down your career with both humility and courage! About Key Yessaad: Key is a Real Estate Internet Strategist, SEO Trainer, and currently co-Trainer of the i-FAStTRAC Real Estate Training Program. Key has been a Trainer and Business Coach for the past 10 years focusing especially on empowering Agents develop the Skills and Habits of Web Services, SEO Strategies, Blogging, Internet Marketing, and Listing Marketing Success. Amazingly informative and helpful post. Everything is good enough and website is very well designed. I am very glad that I have come across to your blog because you have shared a one of a kind blog which has all the things in a very pleasant manner. Basically I'm a writer I would like to share my website here ( https://laustan.com/ ) and sometimes I wait for your post to get more this type of blogs. A good blog always comes-up with new and exciting information and while reading I have feel that this blog is really have all those quality that qualify a blog to be a good one. What a great post, love this education related post! Great blog you have Thanks for sharing.